With upbeat anthems, quiet confidence, and a wicked sense of humor, Keelan Donovan knows how to light up a room. 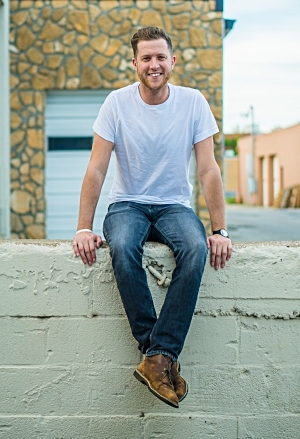 Since first hitting the road in 2014, the Maine-born and Nashville-based troubadour has logged over 600 shows across 48 states and four countries alongside the likes of All-American Rejects, Ben Rector, Matt Nathanson, and New Politics as his music popped up everywhere from Spotify’s coveted “New Music Friday” and “Weekly Buzz” playlists to ABC’s Nashville and a trailer for The Hero starring Sam Elliott. His self-titled 2017 EP, Keelan Donovan [Big Yellow Dog Music/ADA], captures the engaging and enigmatic energy that defines him fusing lyrical storytelling, irresistible hooks, and singer-songwriter spirit driven by rich instrumentation. The 2017 single, “Touch and Go” broke into Top 40 on the Hot AC Radio Chart. Sam Moss is a singer-songwriter living in Boston. His discography ranges from early recordings of instrumental folk guitar to more recent lyrically centered efforts, including the album Neon. Released on Lost Honey Records in March 2018, the album has received praise from both NPR and The Boston Globe. Since 2014 Moss has been regularly on tour, performing in all manner of venues: pubs, galleries, abandoned silos, living rooms, and the Newport Folk Festival. He is a recipient of fellowships from The MacDowell Colony and Marble House Project. The Hudson Dusters consist of Jon B Woodin and Foggy Otis, two multi-faceted singer-songwriters performing primarily on ukulele and guitar. Accomplished on a number of instruments, Woodin is a member of several orchestras and ensembles such as the Catskill Community Orchestra and Hearts Content Ensemble. For many years Otis played the guitar and bass, but after discovering the ukulele it quickly became his instrument of choice. Woodin and Otis first met in 2016 while standing on line for an open mic at Club Helsinki in Hudson, NY. Since forming, they have gone on to perform numerous times at Club Helsinki and venues across the region. Their self-released debut album Dare To Dream, will be released in June 2018. Michael Hearst is a composer, multi-instrumentalist, and writer, whose vast output is marked by a fascination with extremely specific themes, and with wanting to learn as much as he can about almost everything. His most recent project is a three-part book series, each book geared toward a different large theme: Unusual Creatures, Extraordinary People, and Curious Constructions. The first book, Unusual Creatures, includes the companion album, Songs For Unusual Creatures, and sections of the book have been made into a PBS Digital series. His previous album, Songs For Ice Cream Trucks has been used by at least 50 ice cream trucks around the world. Michael Hearst is a founding member of the band One Ring Zero, who have released nine albums. Hearst has performed and given lectures and workshops at universities, museums, and cultural centers around the world. He has toured with The Magnetic Fields, performed with The Kronos Quartet at Carnegie Hall, and has appeared on such shows as NPR's Fresh Air, A+E's Breakfast With The Arts, and NBC's The Today Show. Combining his skills acquired over more than 40 years as a woodworker, finisher, luthier and working musician, Robert “Cue” Gerhards is known throughout the industry for his expertise, integrity and passion for achieving uncompromising quality. He is the founder of Gerhards Guitarworks, a full-service custom guitar shop located in Windham, NY. As the head of a leading custom shop for nearly 14 years, Cue pioneered many of the exotic and artistic color combinations, techniques and finishes that did not previously exist and are widely replicated today. In addition to offering complete services including basic setups and repairs, restorations and refinishing, Cue creates custom handcrafted guitars. Specializing in fine finishes and restorations, he regularly services numerous world renowned luthiers and is the exclusive finisher for several leading American luthiers. James Hearne cut his teeth in the Philadelphia indie rock scene, touring the Northeast as frontman to bands like The Sobriquets and The Way Home before moving to the Hudson River Valley. After settling in Catskill, NY, Hearne began collaborating with a number of other musicians including Eric Parker (Joe Cocker, Steve Winwood), Rob Stein (Mike & Ruthy Band, Amanda Palmer), Eleanor Kleiner and Elie Brangbour (The Whispering Tree). Taking inspiration from the quiet and peaceful setting of his new surroundings, he started piecing together a new album that reflected the well-worn path of a true rock journeyman. Hearne’s debut LP, Through Private Wars, was released in 2017. With deeply soulful steel-sliding barn-burners and intimate, brittle ballads, the album announces Hearne as a fully-realized singer-songwriter talent to be reckoned with.